Established in 2006, we are committed to the removal of Foie Gras from restaurants and store shelves due to the cruel nature of the product. Foie Gras CANNOT be produced without causing immense suffering and distress. There is no such thing as cruelty free Foie Gras. Venues that continue to serve or supply Foie Gras, with full knowledge of the cruelty it inflicts. 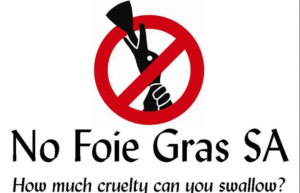 Cape Town took part in the 1st annual World Day Against Foie Gras in 2013. Foie Gras is singled out world wide due to it defining the worst excesses of human greed and self indulgence of the few for fleeting taste, regardless of the cruel and painful process involved. 80 million birds suffer and die annually on Foie Gras farms. Can you imagine how many starving humans could be fed with more than 1600 million kgs of food that is currently diverted for the FG industry each year? For many reasons, we should refrain from importing, buying, supplying and eating this socially irresponsible and cruel product. Master Chef Ralph van Pletzen and restaurateur Arnim von Achim agree, along with WC Premier Helen Zille, Archbishop Emeritus Desmond Tutu, Nobel Laureate JM COetzee and many others, agree that Foie Gras should not appear on any table where there is a modicum of conscience. While local importers defend the practice, independent research by some has resulted in a removal of stock from shelves. The Spar group and Fruit and Veg City / Food Lovers Market are amongst those who no longer sell FG, and the Conde Naste Best Hotel in the World, The Cape Grace, is in the company of the One and Only, the Table Bay, Sun City and South African Airways, all of whom pledged to remove FG from menus for good. It is well documented that any method that achieves the aim of swelling the liver is going to entail extreme cruelty and suffering and the SPCA concurs. Increasing the liver to ten times the intended size must entail agonies. How much cruelty can you swallow? Cruel collection method of feathers for duvets, pillows. Fill out the pledge and fax to 0866 177 157.